At VR Design Studio, we specialized and offer a wide range of static publication design and printing services. We believe that publicity is very important as it is the avenue to showcase your Company and products to attract customers! Name tag: For all exhibition / event / roadshow / hospital / school / hotel / organisation, name tag printing can be done to differentiate your organisation from others. Personalize your employees with an individual name tag. 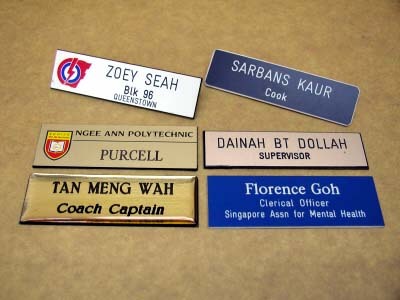 Choose from a variety of name tag type and accessories with a low ordering quantity of 5 pieces. Name tag design services available too.